Spray 4- to 5-quart slow cooker with cooking spray. In slow cooker, mix all ingredients except sour cream, cilantro and corn chips. Stir mixture to break up chicken. Garnish each serving with sour cream and cilantro. Serve with corn chips. In place of the stewed tomatoes with garlic and onion, use regular stewed tomatoes and add a teaspoon of finely chopped garlic. Looking for a Mexican dinner? 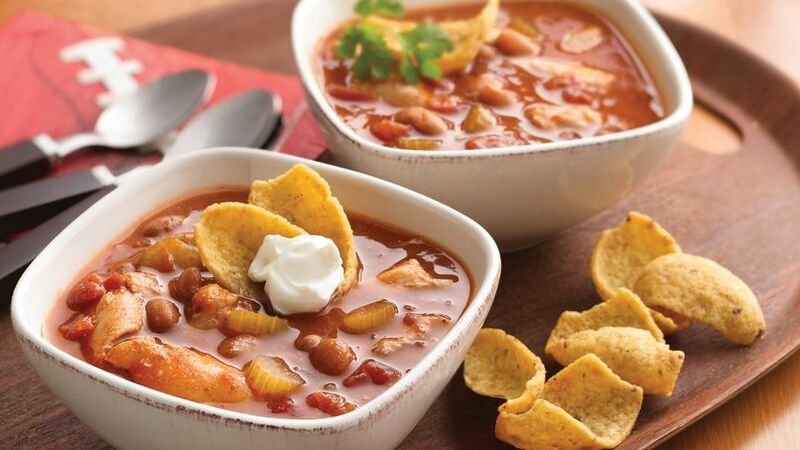 Then check out this chicken and beans chili made with tomatoes and Old El Paso™ enchilada sauce - served with corn chips.